Not even a week has passed since the first rumors surfaced that Marcus Peters could be traded by the Kansas City Chiefs and on the Friday the organization agree to trade the two-time Pro Bowl cornerback to the Los Angeles Rams. Peters is known for his brilliant play on the field thanks to his exceptional ability to cover receivers, but has been labeled with attitude problems. Those problems go back to his days playing for the University of Washington and being dismissed from the team during his junior year after problems with the Huskies coaching staff. Similar issues have taken place while at Kansas City and the team decided to trade him with his value still high. The trade becomes official as of March 14 the day the new league year starts. Last season Peters was suspended for the Chiefs’ Week 14 game with the Oakland Raiders and sources said the team did not want to discuss a possible long-term extension on Peters’ contract. Los Angeles is taking a big chance. Although he may become the difference maker in the Rams 2018 secondary, he could also be a distraction, but to the Rams it is worth the risk. Peters is a California native and although he is originally from Oakland being that much closer to where he grew up could help. Peters will now have Wade Phillips as his defensive coordinator and Philipps is one of the league’s best at what he does and has dealt with all types during his 35 seasons coaching in the NFL. Peters has two years remaining on his existing contract and at some point the Rams might try to extend that if both the team and Peters are on the same page not only on the field but off it. 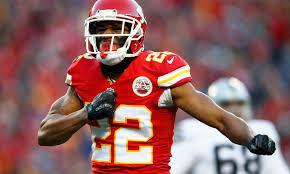 The Chiefs have gained Kendal Fuller in the Alex Smith trade and signed recently released corner David Amerson and add to that Steven Nelson and Eric Berry, the Chiefs have the foundation for a strong secondary even without Peters. The Rams are giving up a host of draft picks in the deal and the arrival of Peters could spell the end for cornerback Trumaine Johnson who last season played with the franchise tag for the second consecutive season and cost the team $16.74 million, and Peters will only be earning $1.74 million this coming season. Free up space under the salary cap will give the Rams the ability to sign Aaron Donald to a long term deal as the defensive tackle becomes an unrestricted free agent in 2019. They also need to sign Sammy Watkins their talented wide out and Lamarcus Joyner at safety to long-term deals.